Smart energy infrastructure and an entrepreneurial spirit will play an important role in driving energy transitions around the world. 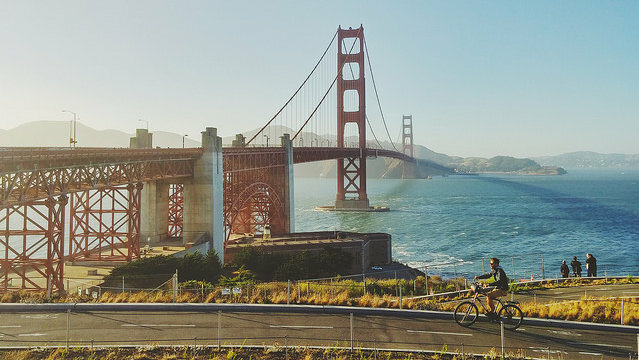 Cem Özdemir, Co-Chairman of the German Green Party, traveled to San Francisco to witness how innovative solutions are driving low-carbon development in the Bay Area. Here he explains how California could serve as a model for German start-ups. hbs: Cem Özdemir, you have spent the last two days touring innovative companies in San Francisco and the Bay area, what has impressed you most? First of all, I would like to thank the Heinrich Boell Foundation for making this trip possible. I am really impressed by what I have seen here. On the innovation side, it’s not that we start from scratch in Germany – we have a powerful engineering, car manufacturing and chemicals industry. The thing that impressed me most in California is the spirit by which everyone is looking for the next innovation and idea. I think that’s really something we as Germans can learn from. Another big difference between California and Germany is that the start-ups here in the Bay Area are much quicker to receive the necessary funding and tap into the essential networks to grow and to push their ideas forward. hbs: You have been a proponent of transatlantic relations for many years. Where do you think this US entrepreneurship stems from? I think it goes back to the founding of this country. People arrived and had to settle with nothing; there was no state entity to set regulations or take care of the people. As a result, people had to take matters into their own hands and get organized. The state followed society. This has resulted in a unique American mentality: get moving – don’t wait for government regulations – to make things possible! One of the things that struck me most was the spirit that I saw at the Environment Department of San Francisco. Everyone working there was deeply convinced that their work was important, that their society and NGOs matter, and that innovation drives the city forward. And they have a large innovative sector from which to draw from. The city will set itself targets and do everything in its power to meet them. San Francisco is setting itself highly ambitious targets – the so-called 0-50-100 target – that calls for zero waste, 50 percent of all trips made outside of personal vehicles and 100 percent renewable energy in its electricity generation. These are not easy targets, but I think they constitute the only way in which to drive and mobilize a low-carbon society. hbs: One of the big focuses of your visit in California has been the issue of smart energy infrastructure. Germany is currently going through an ambitious energy transition. How does the issue of smart infrastructure factor into the energy transition in Germany? First of all, Germany has achieved a lot since the decision for the energy transition, and we have come a long way from just focusing on feed-in tariffs and the nuclear phase-out. Now, the market has to play an increasingly important role. We are now in a situation in which we realize that all sectors matter when it comes to combating climate change, whether it is transportation, manufacturing, agriculture or energy industry. Another crucial point is that we need to look into how we can consume energy more efficiently. We need to look at buildings and appliances that determine how we consume energy. I am deeply convinced that a more smart energy infrastructure and a gradual digitalization offer huge opportunities, for example in smart metering, smart homes, and smart cities. The key word here is “smart.” That’s the way we have to move forward, and the good news is that a lot of German companies are already well positioned here. I believe that it is critical for policymakers to set the necessary framework to incentivize a smarter use of energy. hbs: Smart energy infrastructure relies on data collection. What is the German debate on this issue? As always, and with good reason, there are concerns of about increasing digitalization: What could happen with the data? What are some of the intentions of those who collect it? Where does the data end up? These are all very important questions when it comes to data privacy. However, we should not dismiss the opportunity out front and rather look for legal safeguards to avoid the misuse of data. hbs: In 2011, Foreign Policy magazine named you as one of the top global thinkers for “making it easier for Germany to go green.” In 2011, the Green Party reached its highest popularity after the Fukushima crisis. However, times have changed, and the Energiewende has become part of the political mainstream in Germany. What idea do the Greens have when it comes to pushing the energy transition into the next phase? First of all, we need the Greens to form part of the governing coalition in Germany. When I listen to Angela Merkel’s speeches abroad, I often get the feeling that she is speaking at a Green Party convention. Yet as soon as she returns to Germany, she goes back to the old rhetoric and steps on the brakes of change. I believe that without the Greens, green policies won’t happen. Therefore, we – as the Greens – need to advocate for a green government and a green society. For the Greens, I think we need to realize that we are not outside politics anymore; we are at the center of everything and form part of the political mainstream. Therefore, we should bring substance back to the green political mainstream and work with those who want to live in a green Germany. That’s precisely the biggest challenge for the next general election in 2017. We need to take the successes that we are already seeing on the state and city levels to the national level. Cem Özdemir (@cem_oezdemir) is co-chairman of the German political party Alliance ’90/The Greens. This interview was conducted by Alex Magaard, Ecology Intern, hbs North America, June 26, 2015.